We are very grateful to the Parkdale Queen Street West Community Health Centre for allowing us to use their space for a beta test site and the Parkdale Sewing Repair Hub project. They now need their space back for a vital community project that will save lives. We are not hibernating while we do not have a public space, but rather are really busy with behind the scenes work to really get this off the ground! ​It was an amazing start for us iat 1229 Queen St. West, but now we have moved back into storage temporarily as we build toward establishing a Non-Profit and Social Enterprise status with a great business plan, and then we will look for serious funding and permanent space. We are looking for people with varied expertise to be part of this. 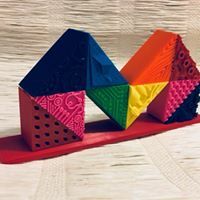 Now that we - and you - have had a small taste of what is possible for Creative Reuse Toronto, we encourage you to share your stories, pictures and creativity with us on FaceBook. And keep your eye out for meetings and events. We will continue to hold workshops/demonstration that will be at events around the City. The first is April 21 at the CSI Toronto Tool Library space on Spadina. We will also be at Spring Into Parkdale at Queen and Cowan on May 11. We hope to get to the Maker Festival again this year in July. We had a series of fundraising sales! We managed to meet our initial modest fundraising goal and exceed it by a bit! Thank you to all who came and supported us! Everyone helped us redivert approximately 1500+ lbs of textiles and textile related materials that might have otherwise ended in landfill. ​A huge thank you, especially to our key supporters - King Textiles and Downsizing Divas. And most importantly - to our amazing volunteers who have done everything from sort, fold, weight, organize and sell, to moving and sweeping floors. None of this would be possible without all of you. We won one of the Best in Show Awards, and our participants diverted 150 lbs. (68 kilos) of mixed materials and textiles in 2 days. We were able to teach new skills such as sewing, creativity, making t-shirt yarn and more. We weighed the projects - even the tiny ones. We may have missed about 50% of the projects that went home for our weigh-in. Ounce by ounce, gram by gram we can make a difference. The tables were almost constantly busy and we had almost 20 amazing volunteers to come out and help us. Our email newsletter list has grown by leaps and bounds and we connected with both makers and learners. ​Many thanks to Eric Boyd, our volunteers and to the Maker Festival for transporting us, and assisting with logistics. We are currently working on setting up Creative Reuse Toronto and are at the planning stages. We hope to partner with other initiatives and groups that have the same objectives and vision in order to create a larger scale sustainable program. 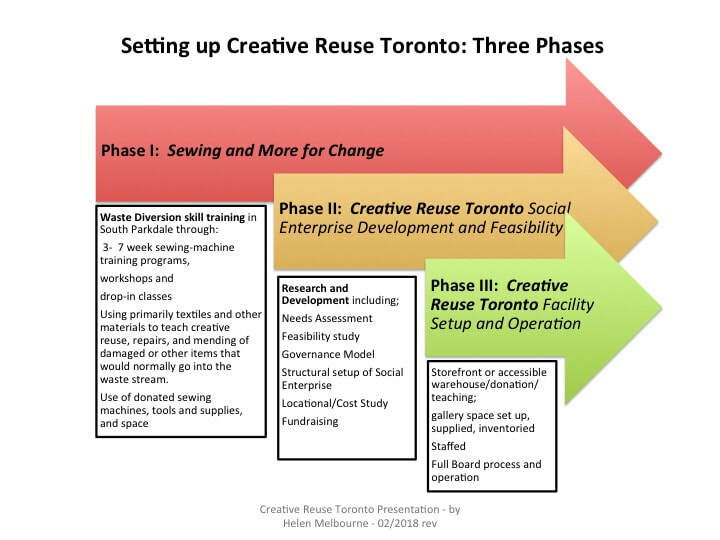 While we work on feasibility, governance models, legal issues, and all of those details, Phase I is beginning with teaching creative reuse programs and skill sharing, mostly in the Parkdale area of the City of Toronto. We are also now partnering with Greenest City and the City of Toronto on The Parkdale Sewing Hub. Click the link to here to see more about this project. See the diagrams below for part of the facility concept we are working toward. Our ideas and concepts are evolving rapidly. If you would like to have a presentation made to your group, please contact us to make arrangements.